Published: Aug. 2, 2013 at 08:26 p.m. Updated: Aug. 4, 2013 at 12:24 a.m.
Marshall Faulk said it well during his Hall of Fame induction speech: Canton, Ohio, is "football heaven." The men and women who run the Pro Football Hall of Fame are the gatekeepers. Like so many of you, my love of football never wanes. And like so many of you, I somehow never visited football heaven. Until this week. With the following images, I hope to give a quick peek on what's inside the Hall of Fame. You need more than one photo essay or one stroll through the Hall to do it justice. I could have lost myself for hours in a variety of rooms, but this trip will have to suffice until next year. I had a choice to make with this assignment. I could have NFL.com's awesome photographer Ben Liebenberg just take shots of all the beautifully lit showcase exhibits at the Hall of Fame. Or I could ask for someone to take me deep into the basement. Only 5 percent of the Hall of Fame's inventory is above ground for the public to see. 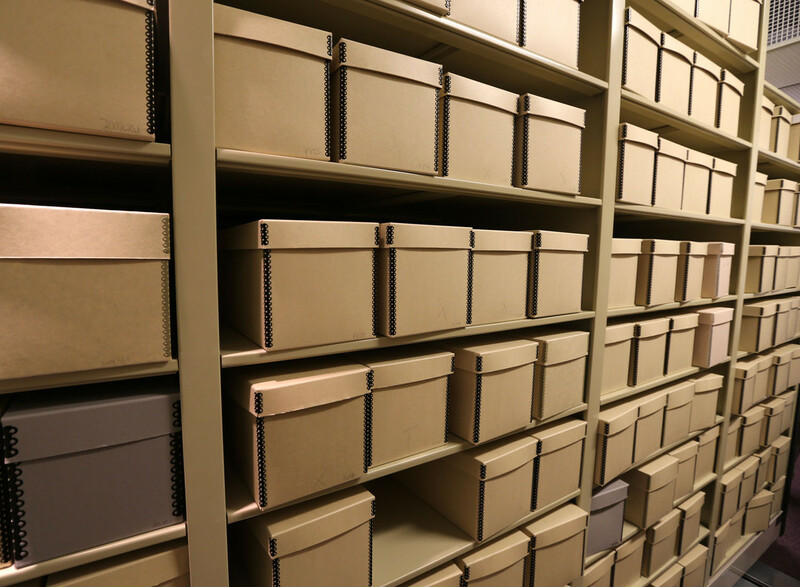 The rest is divided into two archives: a 2-D archive and a 3-D archive. The former includes photos, tickets and other notable papers. I ventured instead into the bowels of the facility for the 3-D archive, where they store 700 jerseys, gloves, cleats and every other random artifact you can possibly think of. The first batch of photos were taken in the archive. I wanted to open up all these boxes of balls, but that's frowned upon. Cleveland Browns soda has a bitter aftertaste. Player health and safety was always a problem for football, even if it wasn't taken as seriously in the old days. This facemask was an attempt to protect a player from the ravages of the game. It didn't stick because it frightened small children. We always hear the stat that no NFL coach has won a Super Bowl leading two different teams. It's a stupid stat. Weeb Ewbank won two NFL titles with the Baltimore Colts with Johnny Unitas, and then beat the Colts in Super Bowl III with Joe Namath. Among offensive minds, Ewbank is too easily forgotten. (Despite a great Dr. Z book about his 1973 season.) The guy was named as the coach of the all-time AFL team. Weeb Ewbank rant over. Here are some of Ewbank's game films from his days with the Jets. It would be sweet to fire these bad boys up. Randy Moss has really big hands. It doesn't get much better for Green Bay Packers fans: Ray Nitschke's jersey, Mike McCarthy's jacket from his Super Bowl win, and a helmet from Hall of Fame 1940's halfback Tony Canadeo. Love that helmet. This choice is a little random and maybe doesn't look fancy, but it's a great slice of football history. Paul Brown was the first NFL coach to film practice and games. This tripod (and others Brown used) essentially created "All-22" footage as we know it. This is the craziest football I saw in the archive: A 1902 ball from the first indoor football game of all time. The game was played in Madison Square Garden as part of something called "The World Series of Football." Baseball's World Series started one year later. And we're out of the basement. I feel bad for the countless things we didn't include, from Hank Stram's desk to Tom Dempsey's ankle tape to a box of all the busts from the 2013 class. (Warren Sapp's bust is outstanding.) There were plenty of oddities above ground, too, and it doesn't get any more random than Terry Bradshaw's "CD-ROM" game. If Al Gore invented the Internet, Bradshaw apparently invented fantasy football. Let's go back to the very beginning. The Hall of Fame is largely in Canton because of a 1920 meeting in a "Hupmobile" showroom of Ralph Hay, the owner of the hometown Canton Bulldogs. George Halas was one of the attendees, and the result of the meeting was the American Professional Football Association (APFA), which was renamed the NFL in 1922. The NFL basically was invented by a bunch of guys sitting on the side of this car. There's so much to love about this display. Ernie Nevers and the Duluth Eskimos actually wore these robes on the sidelines during games as a way to promote their traveling team. The 1926 Eskimos played 28 of their 29 games on the road: Hence the enormous storage box. (Nevers, the team's star, reportedly played all but 29 of 1,740 minutes on the barnstorming tour. Pittsburgh Steelers fans know the story well: Art Rooney Sr. missed seeing the Immaculate Reception because he was in an elevator at the old Three Rivers Stadium, on his way down to the locker room to console his team. When they tore down the stadium, the elevator plate (and the patch of turf where Franco Harris caught the ball) was sent to Canton. Everyone whispers with reverence in the busts room. It's as if people want to listen in on all those conversations between the busts at night that John Madden talked about. I have to agree with my friend/adversary Dave Dameshek: The 1993 class at the Hall of Fame looks like the best of all time. Bill Walsh, Walter Payton, Chuck Noll, Dan Fouts and Larry Little. They have made room for the class of 2013. The busts officially arrive upstairs on Sunday morning. I don't have a lot of rules when it comes to photo essays. But when Wes Welker and Kai Forbath are randomly displayed together in the Pro Football Hall of Fame, it has to be included. Perhaps it's my growing weakness for sneakers, but I find the evolution of cleats display more fascinating than I probably should. Before round-the-clock coverage on RGIII's surgically repaired knee, there was Joe Namath's knee brace. There were also reporters allowed in to Namath's hospital room to talk to him after the procedure. We might watch football a long time before seeing a legend like Ray Lewis write a better final chapter to his career. This was the uniform he wore against the 49ers. Ray Lewis finished last season holding the Lombardi Trophy. The winning team in New Jersey this coming February will hold this particular Lombardi up. Until then, it will remain in Canton. If your love of football is like a sickness, you owe it to yourself to go see it.